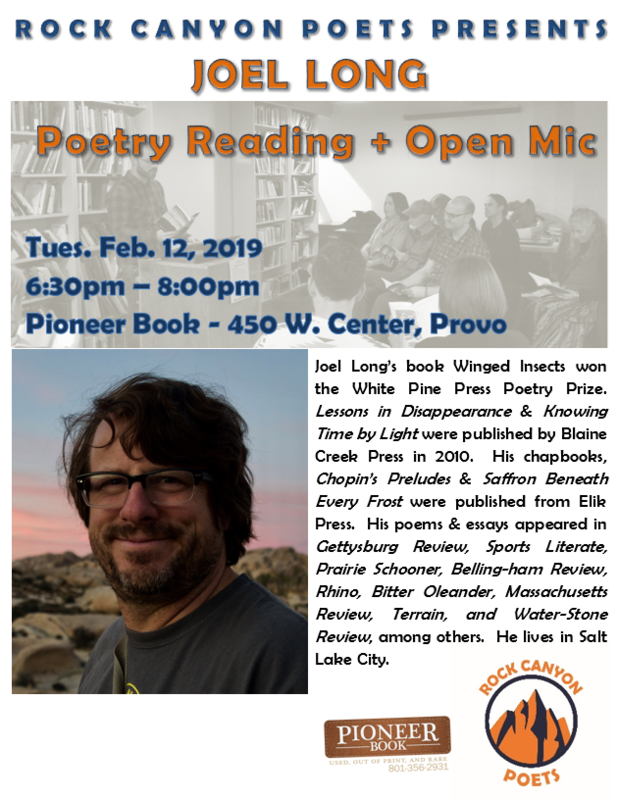 Rock Canyon Poets and Pioneer Book are please to present Utah poet Joel Long! 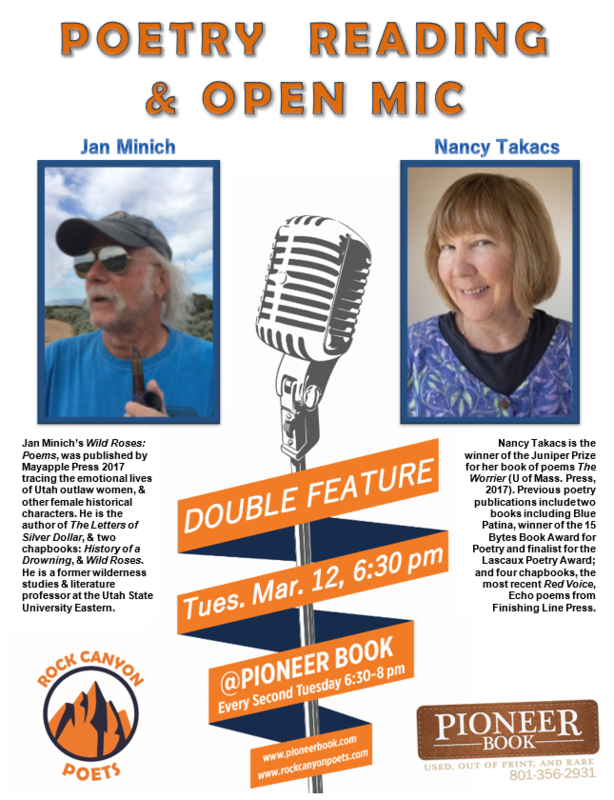 The event begins with an open mic at 6:30pm and runs until 8:00pm at Pioneer Book (450 W. Center) in historic downtown Provo on Tuesday, February 12, 2019. You can also watch him perform his Bite Size poem “Fate of the Animals” from 2009. Joel Long’s book Winged Insects won the White Pine Press Poetry Prize. Lessons in Disappearance and Knowing Time by Light were published by Blaine Creek Press in 2010. His chapbooks, Chopin’s Preludes and Saffron Beneath Every Frost were published from Elik Press. His poems and essays have appeared in Gettysburg Review, Sports Literate, Prairie Schooner, Bellingham Review, Rhino, Bitter Oleander, Massachusetts Review, Terrain, and Water-Stone Review, among others. He lives in Salt Lake City. Long visits Pioneer Book as a guest of the Rock Canyon Poets and Pioneer Book. The reading and open mic are open to the general public. 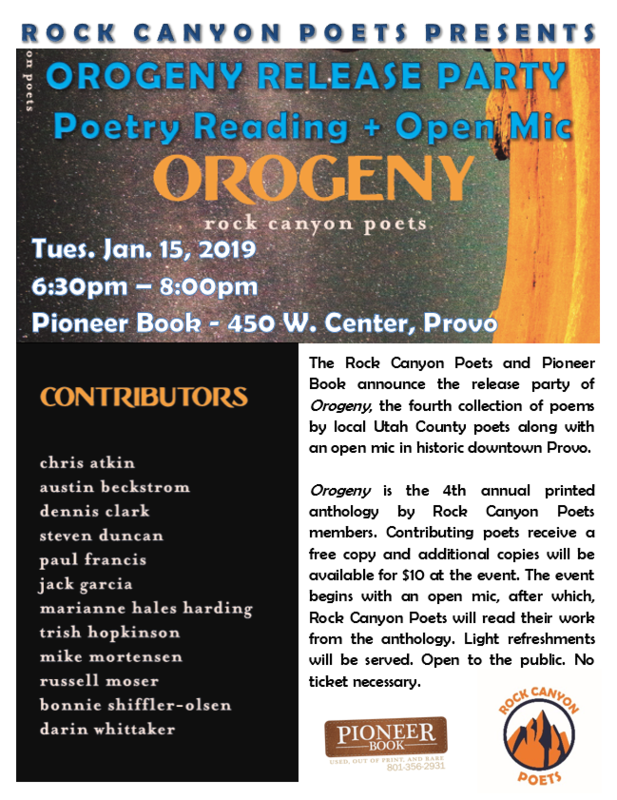 The Rock Canyon Poets and Pioneer Book announce the release party of Orogeny, the fourth collection of poems by local Utah County poets along with an open mic on Tuesday, January 15, 2019 at 6:30 pm. Orogeny is the fourth annual printed anthology by Rock Canyon Poets members. Contributing poets receive a free copy and additional copies will be available to the public for $10 at the event. The event begins with an open mic, after which, Rock Canyon Poets will read their work from the anthology. Light refreshments will be served. Open to the public. No ticket necessary. 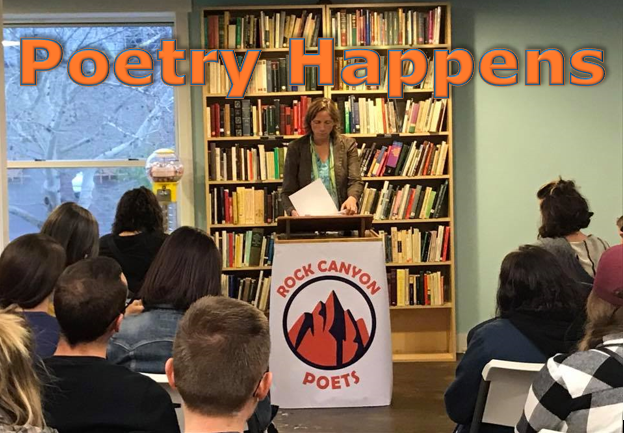 Rock Canyon Poets boasts diverse membership, ranging from 18 to 70+ years in age with many backgrounds–including literary journal founders, editors, ex-military, business professionals, a playwright, and a periodontist. 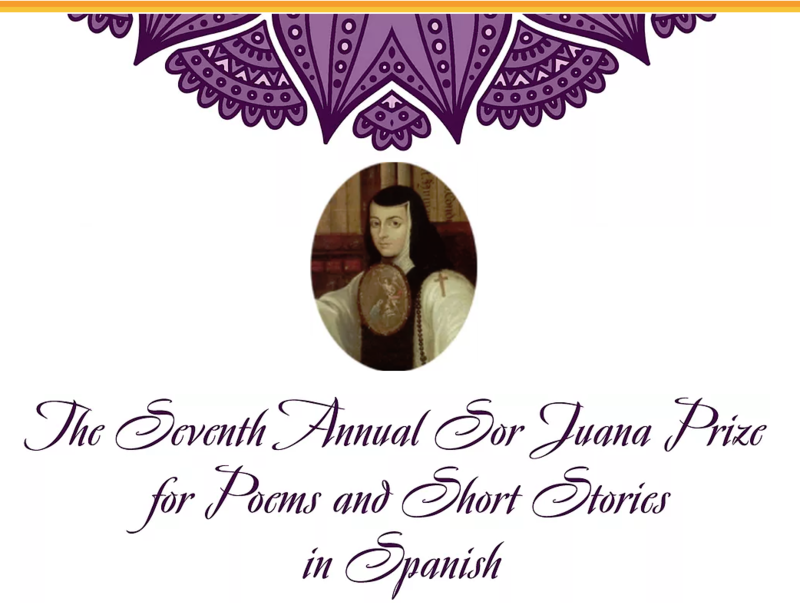 Individually, they have received several awards and been published in magazines, anthologies, journals, chapbooks, and full-length books of poetry. 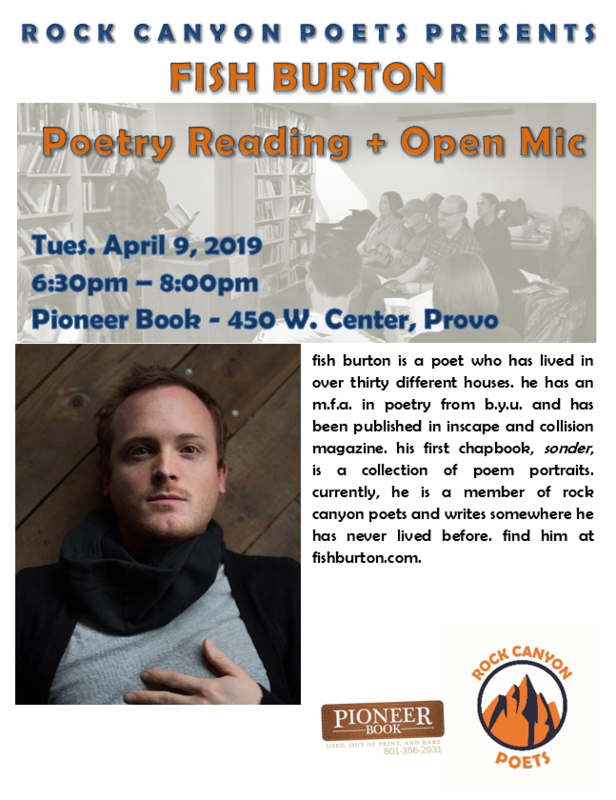 Rock Canyon Poets offer poetry with the tactile clarity of tin-can messages through fuzzy strings to the ears of an audience. These poems are tumbleweeds in semi-truck grills. They get stuck in your teeth, build bridges of spun sugar, and make it possible to mount a camel without a sturdy ladder.